Beatrice, Lady Somerfield, is too busy acting as chaperone for her headstrong niece to take her friends’ advice to find a lover. Maybe next year, she thinks. Until a dark stranger at a masquerade ball makes her realize what she’s been missing. But when her private fling with Lord Thayne leads to public scandal, more than one life is turned upside down. The hero of Just One of Those Flings has recently returned from several years in India. Learn about the research that went into his fictional diplomatic mission, as well as the special artistic passion he shares with Candice. Library Journal awards Just One of Those Flings a starred review that says: "Effervescent, unconventional, and brimming with honest sensuality, Hern’s second installment in her clever, well-conceived Merry Widows series about five wealthy widows bent on avoiding marriage but experimenting with affairs is a lively, thoroughly delightful tale that is sure to please." Romantic Times BOOKreviews names Just One of Those Flings a TOP PICK! Their 4½ star review says: "It might be just one of those flings, just one of those crazy things, but it's a rare reading experience in Hern's capable hands. She brings the Regency to life with her endearing characters whose steamy passion (and May-December romance) only serve to heighten the powerful emotions and leave you begging for more. " Historical Romance Writers says: "Brilliant characterization, steamy love scenes, and witty dialogue make Just One of Those Flings one of the most engaging books I have read this year." Romance Reader at Heart says: "Candice Hern writes as an artist paints—with beautiful lines and special attention to details. The final piece of work is something to treasure. The May/December romance between Beatrice and Gabriel only made their love affair even more special, and Ms. Hern graces this topic with elegance. The final declaration of their love is unforgettable. 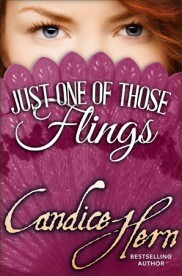 Just One of Those Flings is a beautifully written romance. It absolutely gets a Top Pick from me!" 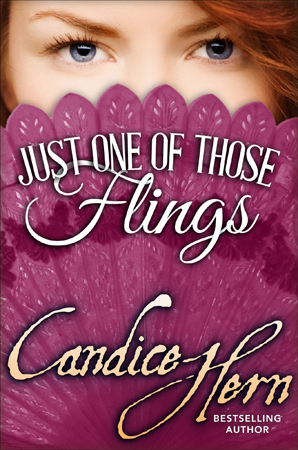 Just One of Those Flings WINS the National Readers Choice Award for Best Historical Romance. He kissed her softly then stepped away. Beatrice closed her eyes and tried to make sense of what just happened, what she’d allowed to happen. She began to tremble a little in the aftermath. Or was it the cool night air? Or the sudden realization that she’d lost all sense of decency and been sexually intimate with a perfect stranger? Though her body still thrummed with the after effects of sexual release, her mind found clarity at last and understood the outrageousness of her behavior. How had she let it go so far? She knew when they went outside that she would be soundly kissed by the dark stranger, but had she expected … this? No, she had not. Had she? Heavens, she was so confused. She had enjoyed his obvious interest, wanted him to kiss her. But had she truly imagined it would lead to anonymous coupling up against a wall, for God’s sake? One thing was certain. She knew when a line had been crossed and the ultimate intimacy was about to occur. She could have stopped it, she could have said she did not want it. But she had not done so. Because she had wanted it. There was no denying she had wanted it. But to have given in to her desires, to have shown no self-restraint whatsoever, to have allowed a strange man access to her body suddenly made her feel off balance, stupefied and stupid. She did not know whether she was overwrought with outrage, or outrageously thrilled. Should she feel shamefully disgusted, or deliciously wicked? Yes, she had been intrigued by his interest, and attracted to him. And the masks, the music, the revealing costume had all made her feel quite daring. The anonymity of the encounter, the sheer boldness of it, had excited her even more and had given her an odd sort of courage. Courage to behave like a wanton. To allow herself to be seduced in a garden outside a ballroom with hundreds of people inside. People who knew her, respected her, even admired her for her work with the Benevolent Widows Fund. People who would be beyond astonished to know what she’d just done. If Beatrice had ever imagined herself taking a lover, and such thoughts had indeed teased her of late, she assumed it would be a discreet affair that took place in the privacy of a bedroom. But this … this rough, unbridled passion in the dark, against a wall, with people wandering about who might come upon them, with Emily just inside … this was not something she could ever have imagined. It seemed so sordid, so dirty. Deep in her heart, she knew it was wrong. She ought not to have let it happen. The best thing to do would be to walk away. Now, while the entire business was still anonymous. Suddenly, it seemed imperative to protect her identity. She did not want this man to know who it was who’d given her body so willingly, and she did not want to know who he was, either. That would make it easier to accept the situation as a moment of madness, an anomaly that was thoroughly out of character. Surely this man would think her a woman of loose morals, a woman who thought nothing of making love in the dark with a stranger. Like a prostitute in Covent Garden. She did not want it known that Lady Somerfield was such a woman. Because she was not. She had never done anything disgraceful or improper in her entire life. She had never been with a man other than Somerfield. All of these thoughts flew through her mind in an instant, jumbled and confused, before she could even stir herself from the wall. She was ready to move away when she felt his hand lift her skirt again and she jumped back with a shriek. No! She would not allow him to importune her again. She would not allow the moment of madness to stretch into two moments, or more. But she squirmed against his touch. The thought of his seed spilling down her legs, a sticky reminder of what she’d done, only made her feel more acutely aware of the coarseness of the encounter. She tried to get away, but the stranger rose again and pinned her to the wall. “Don’t run away, my huntress.” He kissed her again and she pulled back, fighting her body’s treasonous attraction to him in an attempt to end the situation. “Let me go,” she said, trying to sound steady and controlled, but fearing she sounded quite the opposite. His hands immediately released her, and in that moment she knew he would have done so at any time, if only she’d asked. He would not have forced her. He had not forced her. She could not use that as an excuse. And Beatrice intended to keep it that way. She wanted to flee back inside the ballroom, collect Emily, and make a quick exit. She was determined that he should not know her identity. “I have to go.” She straightened her skirts and pulled up the shoulder of the chiton. Her hands went to her hair, securing the combs that had come loose and tucking a few wayward locks into place. She remembered his hands in her hair and hoped to heaven it did not look as messy as she imagined. When she went back inside, would everyone who saw her know precisely what she’d been doing? Beatrice frantically brushed her shoulders and the front of her dress, hoping she was not covered in hair powder. At least it was yellow and would not show too badly against the yellow silk. The gold flecks were a different matter. Why had she thought to add that little embellishment to her coiffeur? She brushed and brushed her hands over the dress and shook out the pleats to dislodge any powder and gold flecks that had been shaken loose. He stood before her, blocking her exit, and she pushed him away so she could pass. He took a step backward. And in that moment, a shaft of moonlight broke through the trees and illuminated the wall beside her. She blinked against the sudden light. Damnation! He might see her face. She quickly stepped away from the moonlight and reached for the strings of her mask. Replacing it as she moved deeper into the darkness, she almost tripped over the discarded quiver and bow. She quickly retrieved them and made a mad dash toward the garden. Beatrice lifted her skirts and ran through the dark edges of the garden until she reached an illuminated path, blessedly deserted. She stopped to compose herself as best she could. She wanted to hurry inside, find Emily, and leave the ball before the stranger found her, but she did not want to run inside looking flushed and … ravished. Besides, he would have to tie those odd trousers back on and replace his turban, which would surely take several minutes. Blast. She looked around her frantically, then hurried down the path when she saw what she needed. One of the herbaceous borders included several large lavender bushes. She plucked off a few spikes and rubbed them along her arms and neck, the friction releasing some of the aromatic oil from the tiny blossoms. The sweet aroma had a calming effect. Her breathing became regular, her pulse slowed, and her clamorous conscience, which had been hammering loud reproof in her head, quieted a bit. Beatrice considered again what had just taken place, and wondered if she had been rash. She had wanted a lover, and had found a willing one. And while it was happening, dear heaven, she had enjoyed it. Should she turn around and go back to him? Remove her mask, stand in the moonlight and boldly announce her name, then ask if he’d be willing to join her in a discreet affair? A couple strolled past her and she pretended to be sniffing the sweet-smelling shrub. Their presence reanimated her conscience, reminding her of the shame and embarrassment she would feel if anyone guessed what had happened a few yards away in the dark. No, it was best to go back inside and pretend it had never happened. If such a thing were possible.